Driving requires knowledge of the rules that you are expected to follow. While many are grounded in common sense, there are others that are instituted by individual states. While you may know the rules in your own state, if you are planning to visit or even move to Kansas, you need to make sure you understand any laws that may be different from your home state. The following are the rules of the road for Kansas drivers that may be different from those that you are accustomed to following. Drivers who move to Kansas must obtain a driver’s license from the state within 90 days of becoming a resident. Kansas has a Farm Permit for those between the ages of 14 and 16 to allow for driving tractors and other machinery. Drivers aged 15 to 16 are only permitted to driver to and from work or school, can’t have any minor passengers that are not siblings in the vehicle and can’t use any type of wireless communications device. Drivers aged 16 to 17 must log 50 hours of supervised drive time. After that, they are permitted to drive anytime between 5 AM and 9 PM, to and from school, work and religious activities, with 1 minor, non-related minor passenger. Driving anytime is permitted with a licensed adult in the front seat. These drivers can’t use any type of cell phone or electronic communications device. Drivers are eligible for an unrestricted driver’s license at 17 years of age. If a driver is convicted of three moving violations within one year. Failing to have liability insurance coverage on a vehicle while driving it. Failing to report a traffic accident. Drivers and passengers in the front seat are required to wear seat belts. Children under the age of four are required to be in a child safety seat. Children between the ages of 4 and 8 must be in a safety seat or booster seat unless they weigh more than 80 pounds or are taller than 4’ 9”. If so, they must be in a seat belt. Signaling - Drivers are required to signal lane changes, turns and stops a minimum of 100 feet before the completion of the move. Passing - It is illegal to pass another vehicle within 100 feet of an emergency vehicle that is stopped on the roadside and has its lights flashing. Following - Kansas requires drivers to follow the two-second rule, which means you must leave two seconds of space between you and the vehicle you are following. If road or weather conditions are bad, you must follow the four-second rule to allow you time to stop or maneuver the vehicle to avoid a crash. Buses - Drivers are required to stop for any school bus, daycare bus or church bus that is stopped to load or unload children. Vehicles on the other side of a divided highway do not have to stop. However, if the road is separated only by a double yellow line, all traffic must stop. Emergency vehicles - Drivers must attempt to move their vehicles so that there is one lane between them and any emergency vehicles stopped on the side of the road. If a lane change isn’t possible, slow down and prepare to stop if necessary. Cell phones - It is illegal to send, write or read text messages or emails while driving. Corrective lenses - If your license has a corrective lens requirement, it is illegal in Kansas to move a vehicle without wearing them. Right of way - Pedestrians always have the right of way, even when crossing illegally or jaywalking. Minimum speed - All vehicles driving under the posted speed limit must drive at least as fast as minimum posted speeds or exit the highway if unable to do so. Adverse weather - When weather conditions, smoke, fog or dust limit visibility to no more than 100 feet, drivers must slow to no faster than 30 MPH. 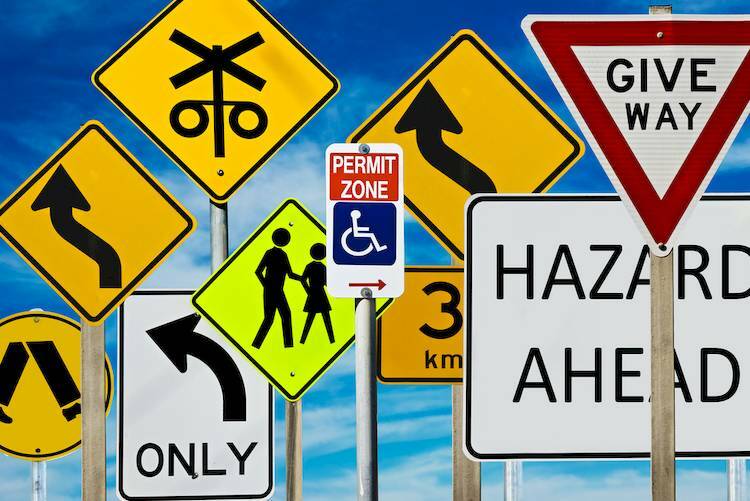 Understanding these road rules as well as the most common ones that don’t vary from state to state will make sure you know exactly what is expected of you when driving in Kansas. If you would like more information, please reference the Kansas Driving Handbook.